Year after year, the Hudson’s Bay and Saks Fifth Avenue holiday window unveiling on Queen Street West mesmerizes Torontonians. The longstanding tradition of attending the unveiling ceremony and admiring the windows is a highlight of the Christmas season for many families and people of all ages. With a free concert by the Grammy award-winning band Pentatonix, this year’s event was just as magical. The annual event brings hundreds of cheerful guests from all over the GTA. The holiday windows on Queen and Yonge streets have been a tradition for decades, and were especially popular during the 1950s and 60s, according to Torontoist. Lord & Taylor, Hudson’s Bay’s leading banner in New York City, was the first retailer to come out with holiday windows, according to the Hudson’s Bay media website. This year, their windows celebrate their 80th anniversary. Hudson’s Bay Company President Alison Coville oversaw the unveiling of the windows. The crowd watched eagerly as the curtains lifted to unveil the five holiday scenes, complete with paint, animatronic figures, and music. The theme of this year’s Hudson’s Bay windows is ‘Shake Up Your Holidays’. The five windows on the side of the store each tell their own story. Most windows are winter-themed, with arctic animals or snow globes, and a holiday jingle playing in the background. The display is framed with twinkly evergreen trimming. Saks Fifth Avenue, with windows on Yonge Street, also upholds the merry window tradition by dressing mannequins in fashionable outfits and placing them in gorgeous sets. This year, the company partnered with Disney to create a jaw-dropping Snow White wonderland, in honour of the cartoon’s 80th anniversary. The theme is ‘Once Upon a Holiday’. Tunes inspired by the Snow White movie soundtrack captivate the passers-by. 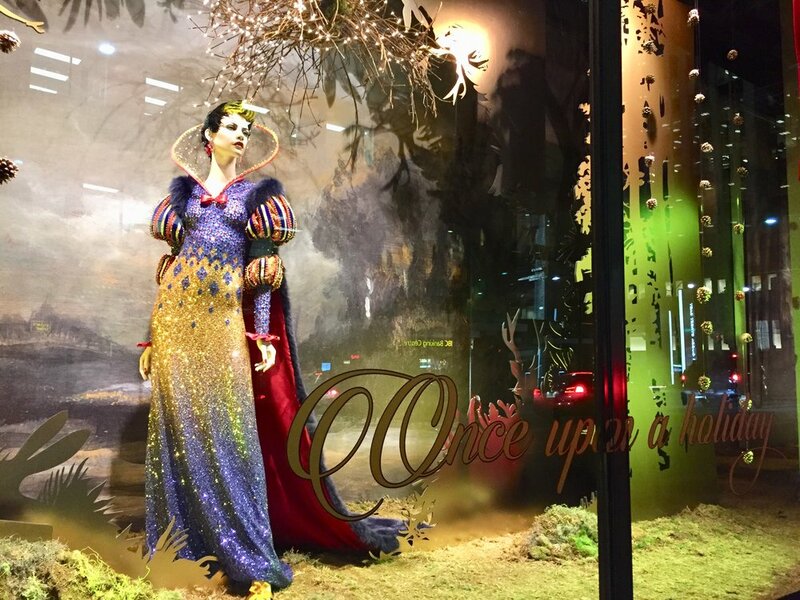 Mannequins wear glimmering gowns of red, gold and blue to match the original dress worn by the Disney princess, and fairy tale items like golden slippers and apples decorate the scenes. This year’s window unveiling crowd was especially excited since Pentatonix was performing. The band is known for their beautiful Christmas music and unique a capella sound. Pentatonix kicked off their Christmas 2017 tour by performing some classic Christmas hits, such as ‘Hark, the Herald Angels Sing’. Among the hundreds of happy bodies at the window unveiling ceremony, it was hard to miss a group of young adults wearing Santa hats, smiling and chatting as the Pentatonix concert wrapped up. “We’re big Christmas fans! 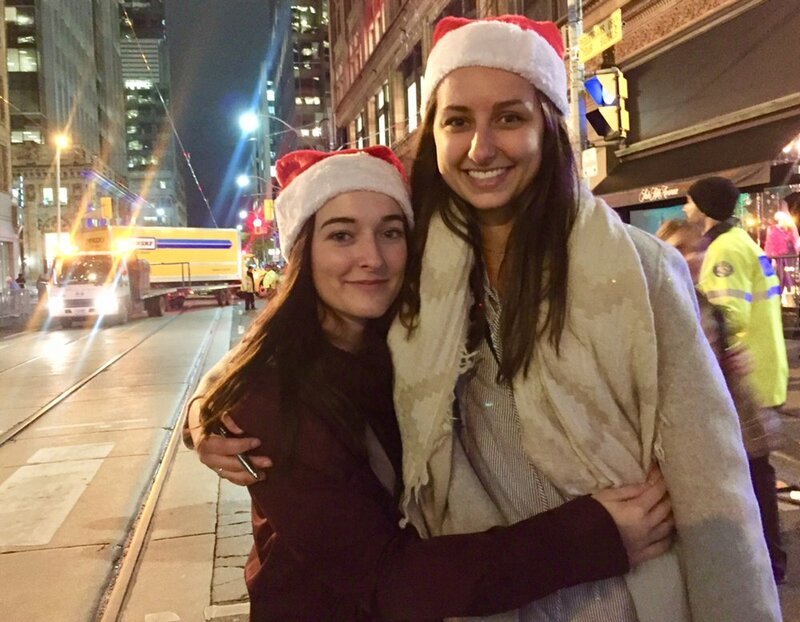 We’re wearing Santa hats and it’s November 2nd,” said Mickaila Sandre and Chloe Forrest. Last year’s event in Toronto marked a change for Hudson’s Bay, as it was the first time in nearly a decade, according to The Star, that the holiday window design strayed away from traditional Christmas scenes. Instead, there were scenes of cute animals with no apparent meaning to them. This year, however, the company went back to a more traditional display, with details like a miniature white tree, stars, and a modern Santa. At any given moment of the day (or night), the windows are surrounded with people. Passers-by pause to admire the beauty, take photos, or simply smile as they walk by the windows on their daily commute. The musical masterpieces brighten up Queen Street with the magic of Christmas.